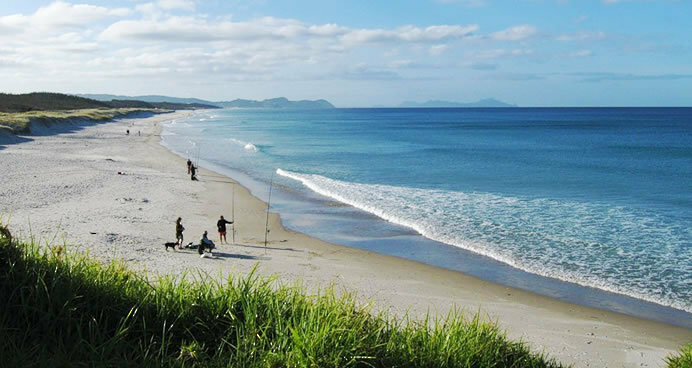 Mangawhai is famous for its fishing...whether you have your own boat, are doing a fishing charter, or, just plan to fish off the beach, Mangawhai has something for you! Our our easy access boat ramp at Wood St you can launch your boat at any tide (the picture to your right shows boaties launching at dead low tide!) and within minutes you are out past Head Rock and off to catch dinner! Experience an unforgettable day fishing, diving or sightseeing from our well equipped charter boat. Departing from Mangawhai your experienced guide can show you the best fishing spots and dive sites in and around Bream Bay the Hen & Chicken Islands, Little Barrier Island the Mokohinau Island group. Excellent salt water fishing and an interesting and varied marine environment make Mangawhai a top destination for corporate trips, weekends away with friends, family fishing and diving adventures and a brilliant, memorable excursion for any holiday in Northland. For all your marine and fishing requirements! Go to the Mangawhai Heads Surf Beach then walk north along the beach until you get to the rocky shoreline and reef area. Go to the Mangawhai Heads Surf Beach and walk out to the head rock, note: you can’t walk out at high tide. Drive down Blackswamp Road, turn left at forestry gates. Drive to the carpark at the end of the road.